Ljósmynd af Oscar Wilde eftir Napoleon Sarony 1882. 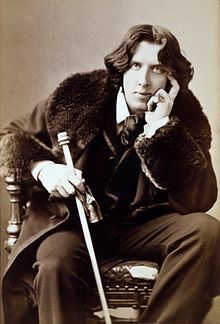 Oscar Fingal O'Flahertie Wills Wilde (16. október 1854 – 30. nóvember 1900) var írskt skáld, rithöfundur og leikskáld sem var með þekktustu skáldum á enska tungu á síðari hluta Viktoríutímabilsins. Enska: A poet can survive everything but a misprint. „The Children of the Poets“, The Pall Mall Gazette 14. október 1886. Enska: All art is immoral. Enska: Truth, in the matters of religion, is simply the opinion that has survived. The Critic as Artist, 1. hluti (1891). Enska: There is no sin except stupidity. The Critic as Artist, 2. hluti (1891). Enska: Conscience and cowardice are really the same things. The Picture of Dorian Grey, 1. kafli (1891). Enska: A man cannot be too careful in the choice of his enemies. Enska: Genius lasts longer than beauty. Enska: Punctuality is the thief of time. The Picture of Dorian Grey, 4. kafli (1891). Þessari síðu var síðast breytt 6. júní 2015, klukkan 12:50.